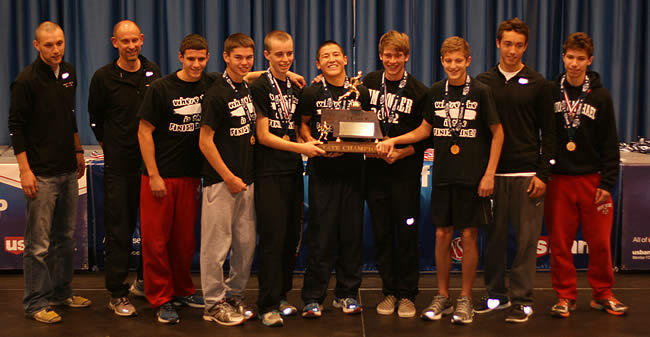 The Knights picked up the 2012 Class B State Cross Country Championship in dramatic fashion with 4 runners finishing as top ten medalists. Thomas Kalil 2nd 16.28.4, JT Cronin 6th 16.48.6, Andrew Karstrom 8th 16.54.7, Jarrett Crnkovich 9th 16:58.9. As a team Mount Michael had a score of 25 points over runner-up Scottsbluff’s 32 points. Mount Michael’s 4th runner, Jarrett Crnkovich, finished ahead of Scottsbluff’s 3rd runner. Mount Michael’s 5th, runner Marcus Cronin, was edged out at the finish line by Scottsbluff’s 4th runner. Mount Michael Freshman Sam Van Haute finished with the 3rd fastest time among freshmen running in the race. This is the 5th Cross Country Championship under the leadership of Coach John Gathje. In twenty years of coaching Gathje’s teams have missed a trip to state only once.